When people think of the ‘first’ speed football boots, they think Mercurial. When they think of the current lightest, they think adiZero. 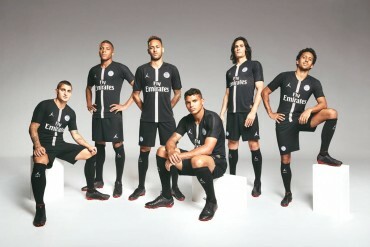 But far from being quiet bystanders, Puma have been plugging away on their range of lightweight boots under a variety of different names for the best part of the last decade. 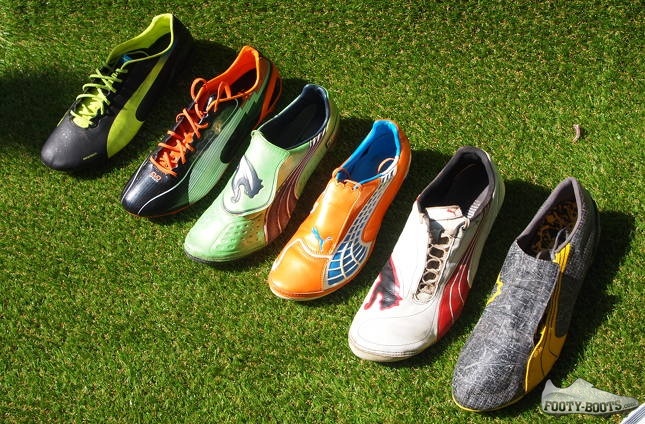 Forerunners in the use of materials like carbon fibre, Pebax and synthetic meshes and microfibres that are so commonly used today, we’re taking a good look at how Puma’s lightweight cleats have changed and evolved since their conception. 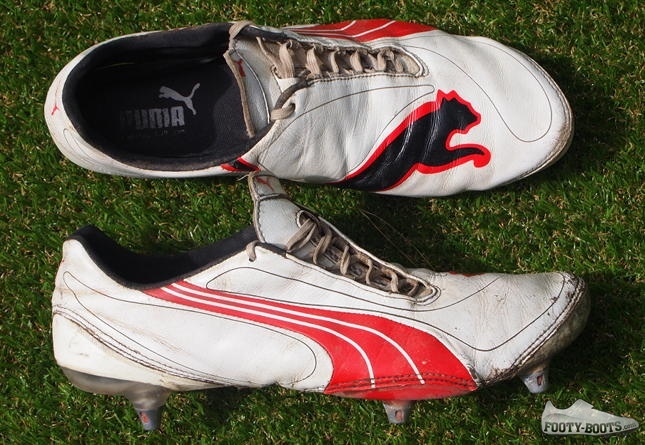 The Puma v1.06 was an absolute game-changer both internally for Puma and externally in the world of football boots that doesn’t perhaps get the credit it’s due. Looking at it’s predecessor, the Icana, the contrast between the two couldn’t be more night-and-day. A clunky, multi-material monstrosity, the Icana was a dog’s dinner compared to the sleek minimalism of the v1.06. For the best part of a century, cobblers had been promising a football boot that gave a ‘sock-like fit’; the v1.06 was the first to give you an actual sock. 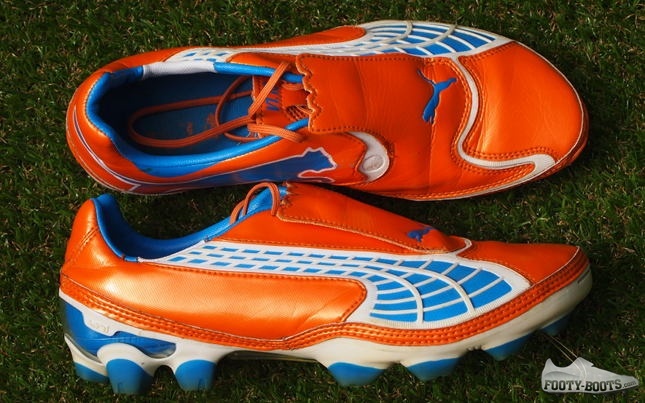 Made of a two-layer ConTec' microfibre, the v1.06 put a mere 0.4mm of material between foot and ball. Bringing in a firm, responsive Carbon Fibre soleplate and TPU external heel counter to the design gave rigidity without undoing the good work of the upper to keep the weight down. 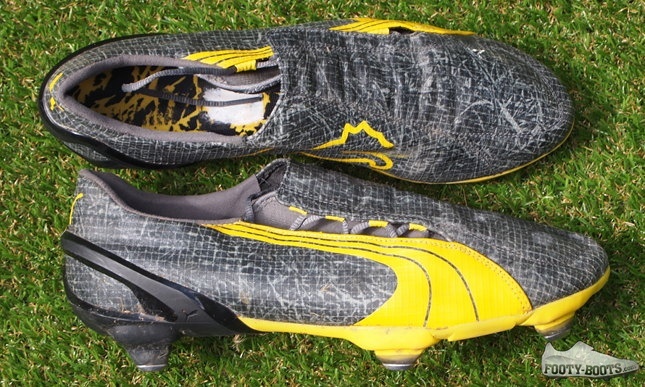 Considered by some to be the single best Puma speed boot in the ‘v1’ range, the v1.08 upper the design stakes over the v1.06 with a super-anatomical shape, offering one of the most radical silhouettes in boot design. Unobtrusive side-offset lacing further the minimalist design, whilst an independent tongue – a feature that was missing on the v1.06 – added to a hugely unorthodox design. 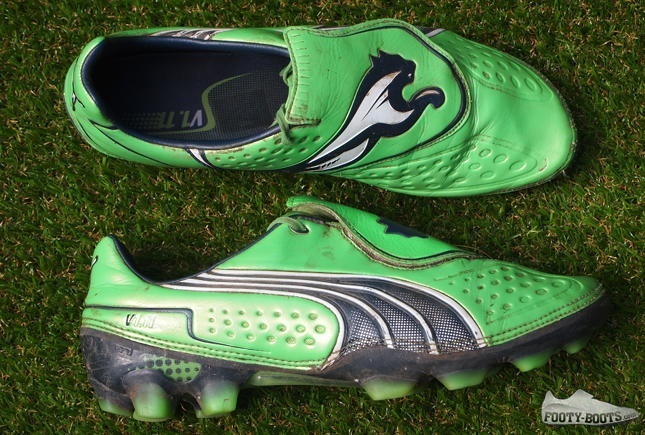 Puma put the ‘Aptolast’ technology in the spotlight on the v1.08, but ConTec and carbon fibre both made welcome returns from the ’06. Bulking up the v1 series was always going to come with some controversy, but the Big Cat managed a fairly smooth transition on the v1.10. Offering up a more substantial microfibre synthetic leather over the v1.08’s Contec mesh, the v1.10 retained a lot of the futuristic feel of the v1.08, along with the Aptolast system and carbon fibre plate (though this time limited purely to the forefoot). 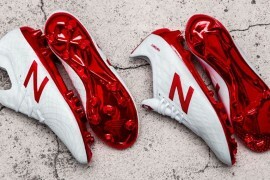 The soleplate brought in big changes, with an all-new FG soleplate at the heart of the new Uni system that was highlighted with a transparent heel counter and soleplate. For all the innovation the v1.10 brought in, it’s design lacked coherence. Stitching ran rampant across the upper, spliced with awkward seams of rubber that didn’t quite gel. Thankfully, the v1.11 was quick to remedy much of that with a design that was equal parts evolution and revolution. The thinner, gel-feel upper was a huge step-up from that on the v1.10 in both looks and performance. 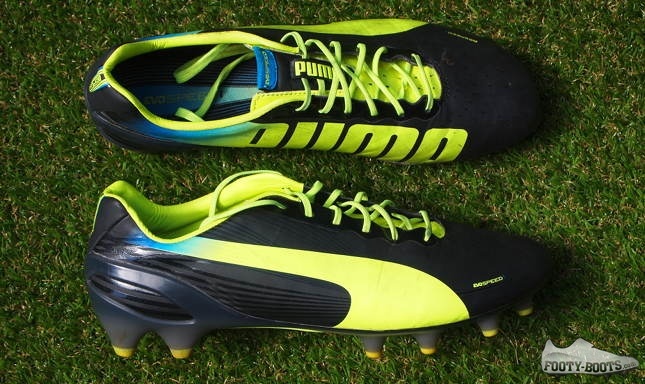 The wrap-over tongue and dynamic use of the Puma logo only added to the dynamism of this incarnation. 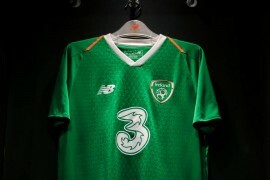 Off the pitch, the speed market had exploded into a different game; adidas’ 2010 release of the adiZero and 2011 release of the adiZero Prime had spawned a swathe of single-layer synthetic boots on a TPU chassis. Carbon fibre was no longer the ‘in thing’, and if you weren’t sub-200g, consumers weren’t necessarily interested. 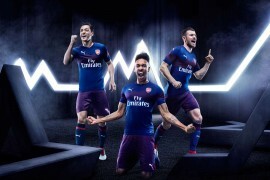 Things were changing at Puma, too – floodgates had opened and the signings of Sergio Aguero, ' Yaya Toure, Radamel Falcao to wear Puma’s speed boots meant Puma were back in the spotlight and needed boots to match. Thus, the evoSPEED 1 was born; a speed boot for this new era of boots, the sub-200g microfibre upper sat on a TPU soleplate with no carbon fibre, re-enforced with the EverFit internal cage. 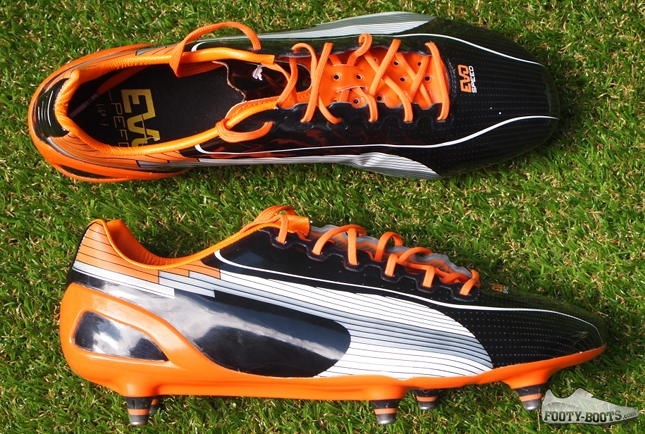 Bringing us neatly to the present day is the Puma evoSPEED 1.2. A boot moulded by player feedback, the evoSPEED 1.2 built upon the foundations laid by the evoSPEED 1 to create a speed cleat par excellence. Bringing in a huge graphical update alongside the new Speedtrack soleplate and Griptex finish to the upper, the evoSPEED 1.2 manages to add to the feature list of the range whilst simultaneously trimming the fat to create a more fuss-free, accessible shoe. 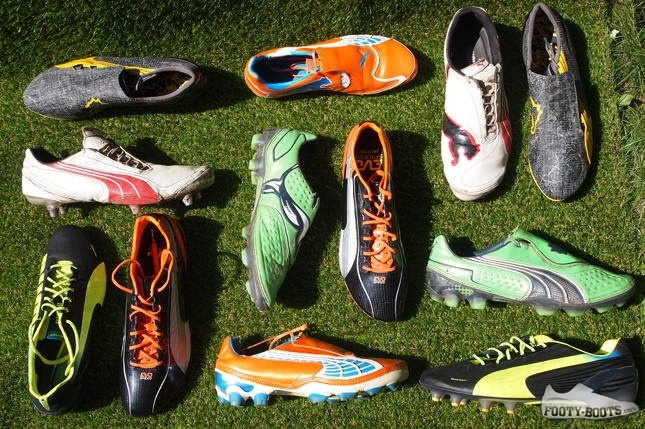 Which is your favourite Puma speed boot of all time? Just ordered a pair of v1.06’s! The second last pic, there’s a orange cleat. I have a pair exactly like that and i would like new ones the same… but no idea what is their specific model. Pls help?